Jane Kirkpatrick, an award-winning author, will be the guest speaker at an “Oregon Author’s Night,” Saturday, April 28, 7 p.m. at the Old Cheese Factory, 94179 Allen Boice Dr., Langlois. 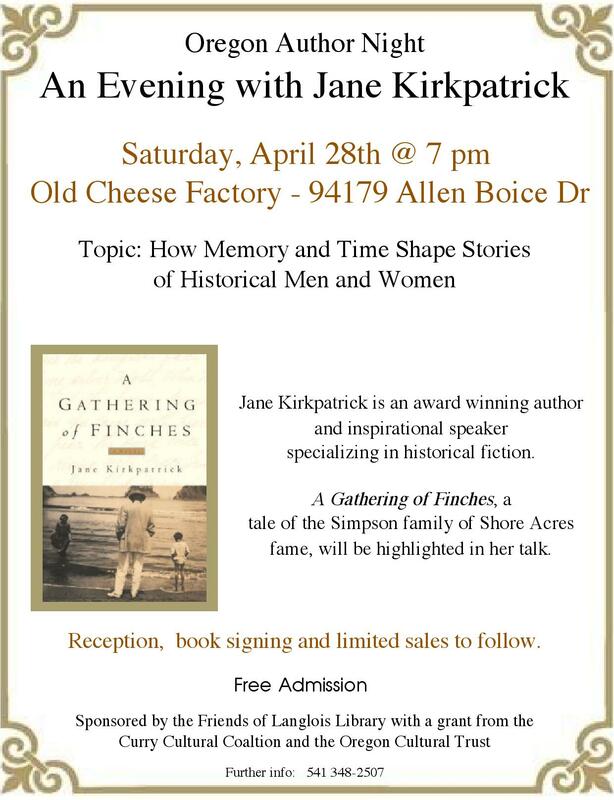 The topic of this “Evening with Jane Kirkpatrick” will be “How Memory and Time Shape Stories of Historical Men and Women.” Besides being a noted inspirational and humorous speaker, Kirkpatrick specializes in historical fiction, often set in Oregon. Included in the topic will be a focus on A Gathering of Finches, which tells the tale of the Simpson family whose estate is now Shore Acres State Park. This book has been a best seller among coastal readers and is often a choice for local book clubs. Some of her books have been selected nationally by the Book of the Month Club and the Literary Guild. Other books of historical interest have featured “real life” pioneers such as the Lilac Lady: Hilda Klager; Tabitha Moffatt Brown, “Mother of Oregon”; and Letitia Carson, one of the few African-American women listed in an early Federal Census in Oregon. A history of the community of Aurora has proved to be especially well-received. This evening promises to be thought-provoking and should be of interest to readers in general, the many fans of Jane Kirkpatrick, and to history buffs. Those unfamiliar with Kirkpatrick’s work will be in for a treat. Anyone wishing to write a memoir and others who have seen the Dolphin Players’ staged reading of a play adapted from the book, A Gathering of Finches, may find the talk extremely engaging. There will be an opportunity to meet the author in person as a reception, book signing, and limited book sales follows the main presentation. Admission is free. This event is sponsored by the Friends of the Langlois Library and the Langlois Library Book Club with a grant from the Curry County Cultural Coalition and the Oregon Cultural Trust. For more info: 541- 348-2507.